So I have not posted in a while. It has been really hard to motivate myself this past week. When work takes a dive everything seems to. And I think that makes sense for me since it is such a big part of my life and since I have a hard time understanding why certain decisions get made. I reposted my resume last week and had an overwhelming response, which makes me happy and is a good thing, but at the same time, can be a lot to keep up with as well. I had about 8 phone interviews Wednesday, and two in person interviews Thursday and four on Friday. I am hoping something comes of one of them, there are definitely some really good opportunities out there. Thursday night was wine club at my house and we had Jason who is a wine educator there which went over very well. The whole thing actually went really well and I think that everyone would like to do one again. 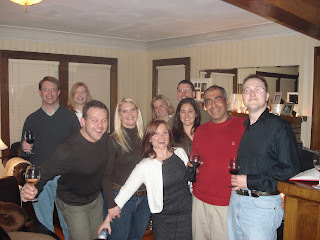 We had about 27 people not including myself, Scott and the wine educator. I received many compliments on my hosting skills and food preperation which was very nice although I still do not think that I was even functioning at 100% because of all of the work stuff but oh well, I did my best under the circumstances. Saturday the boy and I ran to Bloomingdales. I miss the ones out East, the one here at MOA is so empty. We did get him some really nice jeans which he needed. He is so funny, he cannot believe that mens jeans can cost over $100, but I guess that is a boy for you. I found a few things, but nothing special, I really think that my mind was elsewhere. From there we headed out to his brother's for his father's 70th surprise birthday party. Now just to give you an idea of how head in the clouds I have been, it did not even occur to me that I was going to be meeting his whole entire family for the first time. So as we get there and bring the cake in, and I start putting out some apps that I had made, I start getting looks, and then the whispering would start and then the Aunts would approach me. Well of course it was, how long had we been going together, how did we meet, where do I live, what do I do, all that kind of stuff. A few of them had gotten background on me, so they were just verifying so it was really interesting. I guess in some ways I am glad that I did not prepare myself for that. Sunday was spent getting some errands done, car washed and such and then dinner with the boys parents as usual. This week there is not too much in store, I am hoping to have a new job by the end of the week, but we will see. Everyone keep their fingers crossed for me, for sanity's sake anyway!